This Baked Tilapia Fish Tacos recipe is an easy dinner that will take 30 minutes or less to make. The seasoned tilapia fillets are baked in the oven until flaky, then filled into soft tortillas with your favorite toppings. One of our family favorites! Whether you want easy recipes because life is busy or maybe because you don’t enjoy cooking, I get you. The great news is that serving easy dinners doesn’t mean that the meal is lacking anything – in fact, it might just be one of the favorite meals in your house. And this is one example in our house: Baked Tilapia Fish Tacos. We are huge fans of beef tacos, like our tacos made from the shredded meat of our Instant Pot Mexican Pot Roast recipe and our family favorite Beef & Potato Tacos, but these easy fish tacos are another solid favorite. Pre-2009, I never made any fish in our house other than fish sticks and even those weren’t very often. David always said he didn’t like fish, so I never made it. 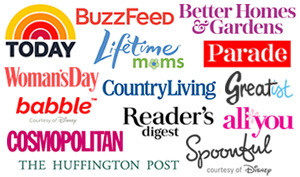 But, around 2009, we started incorporating healthier meals into our weekly menus. Tilapia was the first type of fish I started serving for our dinners. It’s a great, mild flavored starter fish for anyone who’s not used to cooking or eating fish. Most of the time I would coat the tilapia with breading (like panko), but Baked Tilapia Fish Tacos involves no breading or batter. This Baked Tilapia Fish Tacos recipe is super simple and can be made in 30 minutes or less. You can use fresh or frozen tilapia fillets, but I almost always use frozen. I place thawed fillets on a greased baking sheet. The top of each fillet is brushed with a bit of olive oil (I *love* using my OXO Basting Brush for this). Then, each one is sprinkled lightly with a seasoning blend. You can either mix up your own seasoning or you could use a favorite seasoning blend that you have on hand. We usually use one of the seasonings that we have in our cupboard. Before popping them into the oven, you’ll squeeze a bit of fresh lime juice on top too. The fillets are baked in the oven until flaky. While they are baking, I prepare all the toppings: shredded cabbage (we use a bag of coleslaw mix to make it easy), sour cream, avocado, and salsa. I also heat the tortillas. You can use corn or flour tortillas, whichever you prefer. 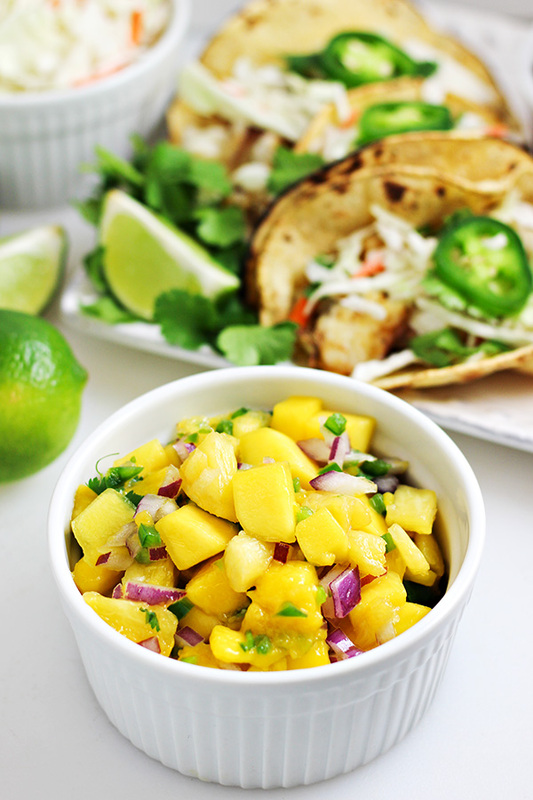 One of my favorite toppings for our Baked Tilapia Fish Tacos is a homemade Pineapple Mango Fruit Salsa. I don’t make it every time we have these, but I do try to because it’s so delicious paired with the fish. Each person assembles their own Baked Tilapia Fish Tacos. One fillet is generally enough for about 2 tacos, but that really depends on the fillet size and the tortilla size. Each person breaks up the fish on their tortillas. Then, they are topped with whatever topping each person wants to use. We usually serve with black beans or refried beans with our tacos, and sometimes rice, fruit, or even tortilla chips with guacamole. To make seasoning: Mix together all seasonings and set aside. Preheat oven to 375 degrees F. Grease baking sheet with non-stick cooking spray. 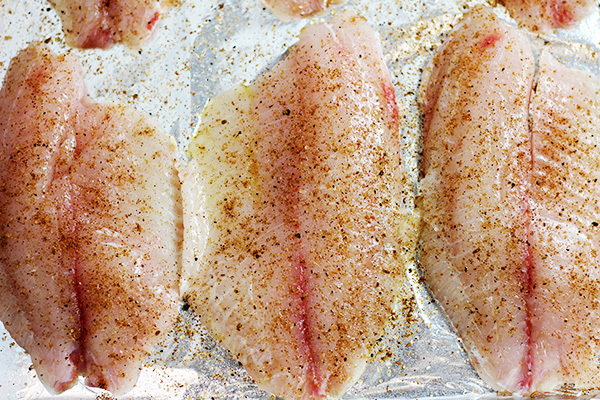 Rinse and pat dry thawed tilapia fillets. Place fillets on the baking sheet. 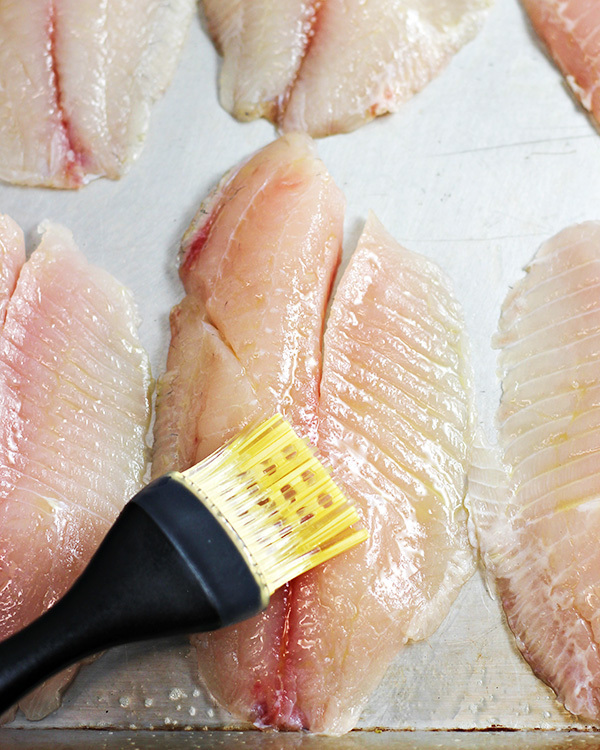 Brush the top of each fillet with olive oil. Season with seasoning blend and squeeze lime juice over the top of the fillets. Bake for 15-20 minutes or until fish is opaque and flakes easily with a fork (test in the middle of your thickest piece). NOTE: Cooking time may need adjustment depending on the thickness and size of your fillets. While fish is baking, prepare toppings and heat tortillas. To assemble tacos: place desired amount of fish, broken up slightly, lengthwise in the middle of your tortilla. Top fish with desired toppings and serve. –If using the seasoning blend in this recipe (or another salt-free seasoning), you may wish to season your fillets with salt and pepper before baking. These tacos look absolutely amazing! Tilapia is one of my favorite fishes to use because it not only doesn’t have a huge “fishy” flavor, it is affordable. These sound wonderful and we’ll have to give them a try. Thanks for sharing. 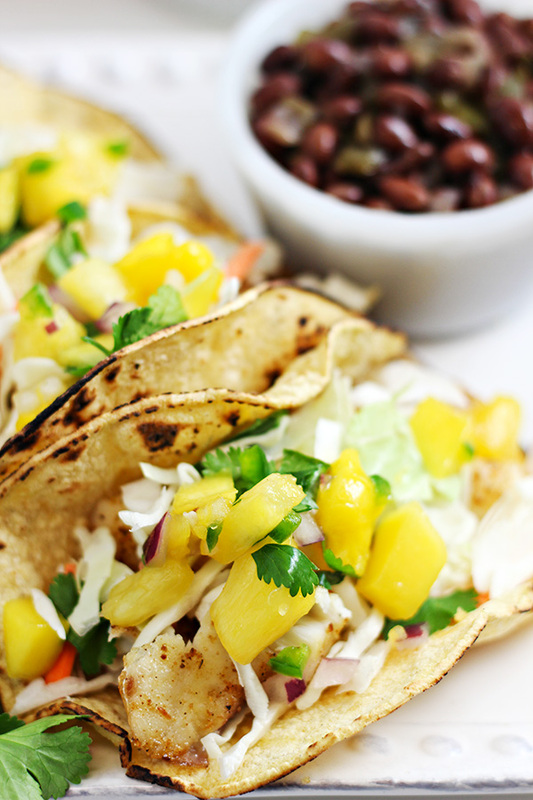 Fish tacos are always welcome in my house…the more the merrier! I would happily eat this all day! Delicious! Thanks for sharing and happy Fiesta Friday. 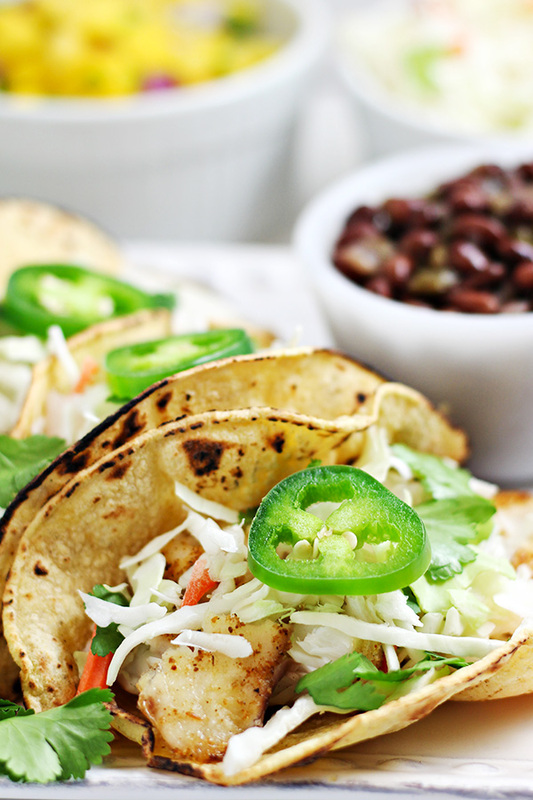 Your baked tilapia tacos look delicious. Thank you for sharing your recipe at the Snickerdoodle Create~Bake~Make link party! Yeah, fish tacos! These look amazing. Thanks for sharing at the Inspiration Spotlight party. Pinned & Shared. 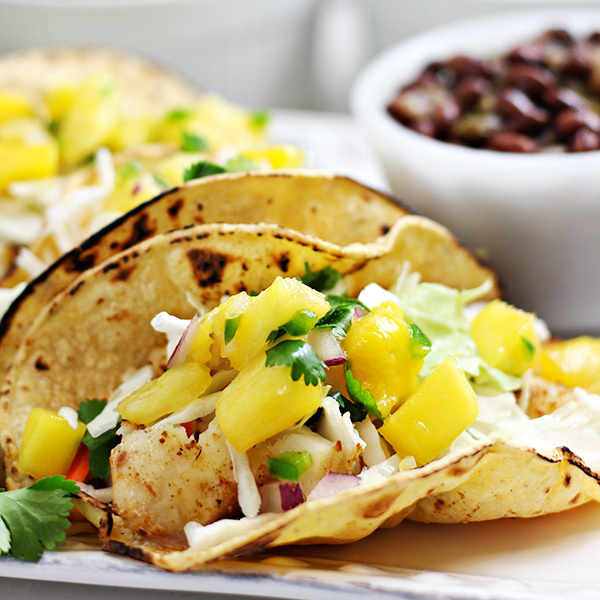 I’ve been wanting to try fish tacos and these sound delicious and easy! YUM! I love tilapia and fish tacos. Growing up in a Chinese family, I’ve always eaten lots of fish. Glad to hear that you’ve incorporated it into your meals – it’s such a delicious, healthy, adaptable protein. I love how easy, quick and tasty this recipe is. I love fish tacos! So fast and easy, Brandie, looks delicious! LOL! I love that I had already planned to have tilapia fish tacos for dinner and opened your blog and bam, there were your fish tacos! 🙂 I make ours pretty much the same way, except I add a little regular taco seasoning to mine and chop them up into small pieces. Yum, yum! Fish tacos remind me so much of home! I have quite a lot of avocados to use up this week and I love adding them to fish tacos so I think this is a must this week. Thanks for sharing. Fish tacos are my favorite home-cooked meal! I’m going to try your seasoning — it looks delicious. Probably since I am usually cooking for just two people, I still lightly fry my tortillas one at a time. I heat up a tiny bit of oil with a sprinkle of garlic salt, then I lightly fry both sides. So tasty! Fish tacos are number one in my book and those look so good!! These look so yummy! Morgan claims he doesn’t like fish either, but I can usually get him to eat it if fried. I wonder if I could sneak in something like this under the radar! Great minds think alike Brandie! I just made tilapia tacos with cabbage slaw a few days ago. Baking the fish is a great idea. I pan fried my tilapia but I think baking them is a healthier alternative. Wowwwww that fish taco looks great!!! Thanks for sharing such a simplified fish recipe. This is a great idea! 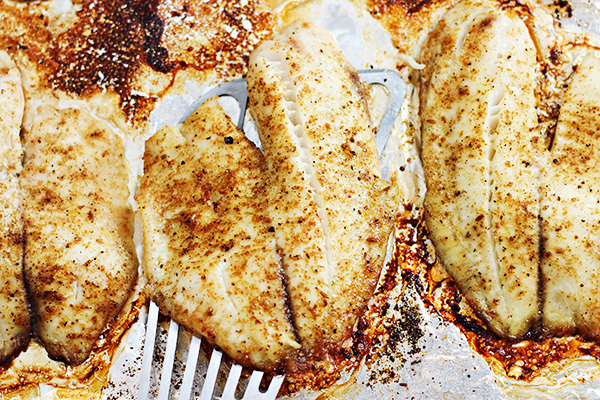 Tilapia was always too delicate to pan-fry, but I like this baking method! 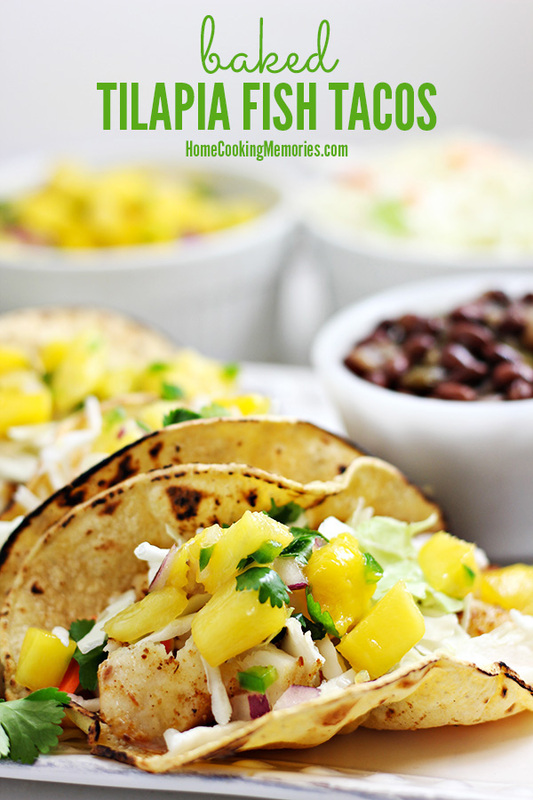 I have been looking for an easy fish taco recipe and this one looks amazing! I can’t wait to try it. I have never tried fish tacos before, but they look so good that I think I will have to now! Thank you for the recipe! 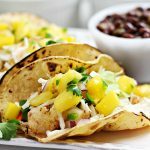 My absolute FAVORITE type of fish tacos are made with tilapia – these are amazing, I want to reach in and grab a plate for dinner! I simply adore fish tacos, and these look so yummy. Very nice blog! Tilapia is a fish all my kids love, so definitely a family favorite! I don´t like fish, but those pics make it look fantastic! Fish tacos are in all of the restaurants where I live, so it never occurred to me to make them myself. I think I’ll try it! Thanks for the inspiration. I love tilapia tacos! It’s one of our faves! YUM! Oh my, I just love fish tacos. Thanks so much for sharing your recipe.